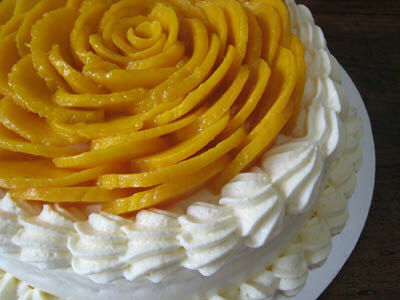 Finally, if that wasnâ€™t enough to eat, you could also have a slice of this visually stunning frozen mango torte which another friend sent over as a birthday present for Mrs. MM. This cake, from “Sweet Bella” was just incredibly beautiful to look at and a nice fruity way to end the meal with a strong cup of tea or coffeeâ€¦ But wait, you must have room for a single little sliver of wickedly dark chocolateâ€¦we did. OMG! Inggit ako! Where did you get the frozen berries from, if you don’t mind me asking. I didn’t know you can buy frozen berries here! The photos look stunning, MM. Sounds like an evening of fun with never ending story,food, wine and desserts and Cinderella stuck with her prince charming in the castle with her glass slippers and the Kid! Happy Birthday again Mrs. MM. What a beautiful dinner…prepared from the heart…good food and good company, what more can one ask for? Sir MM, love the mango torte, where can we buy “sweet bella”? (my sweet tooth can’t stand to have one bite! )and I got curious with your wickedly dark chocolate? hmmm…. gonna be back to check it out! Happy birthday, Mrs. MM! You are one lucky lady as I am sure MM is one lucky dude and the Kid is one lucky princess! Wish you all the best! And don’t let any inggitero spoil the special “ruby” day with baseless and totally inutile comments!!! BTW, that is one beautiful cake! What a carefully designed and beautifully executed meal! Congratulations, MM, and happy birthday, Mrs MM. As a ruby plus woman myself, I can assure you that the best is yet to come. happy birthday, mrs. MM! i agree, the birthday dinner was simple, but elegant and very well-executed! I think that mango torte is the bigger version of the one available at Pink Kitchen. Katrina got one to try and had to hack into the piece that was rock hard. Am having vargas butter cake right now, what serendipity of sorts. No berries compote though. Wow! So that was IT! Perfect birthday banquet! I always look forward to those compote on ice creams. The best things in life!—Love and celebration! Cheers! What a simple and satisfying way to end a great and stunningly organised birthday dinner! Right up my alley! I love berries of all sorts! I’m into wild berry hunting this time as the mushrooms are nowhere to be found the past couple of weeks. Btw, what’s a Vargas butter cake? If the wine turned out to be vinegar, it would have made a wonderful tasting vinegar perfect for salad dressings. My husband opened a 40+ old Rotschild not too long ago which unfortunately turned vinegary as the cork had leaked in air and the wine oxidised through the years. Now we have a well-aged red wine vinager, perfect for vinagrette. Happy birthday Mrs. MM! That was such a special dinner! Cheers! Wow, so much has happened since I last checked out the site. The perils of blogging and free speech – you never know what lunatics will say next, and worse, they feel entitled! That behind all of us, we can move on and celebrate the good things in life. Happy Birthday Mrs MM! You are one lucky gal! It must have been a loooooong dinner, with all that good food and good company. Apicio, expelliarmus is a term used in Harry Potter books to disarm one’s enemy. Apicio, “Expelliarmus” refers to a Harry Potter spell used to disarm opponents. Yesterday I posted some comments but I wonder why it didn’t appear in your site. Just the same, I’m still very impressed with all your works. Wonder why we can only see your gorgeous hat and covering your mysterious face in one of the magazine I read. I see said the blind man. Age and inclination has kept Harry Potter under my radar though partial to Brit Lit. my taste is more towards the Drabble sisters, Margaret and A. S. Byatt. Thanks to MM, Mila and Mila for explaining. What a way to to celebrate Mrs.MM’s birthday- excellent food, great wine, lots and lots of conversation between friends and family and yummy dessert to finish off the evening! This is my kind of celebration!